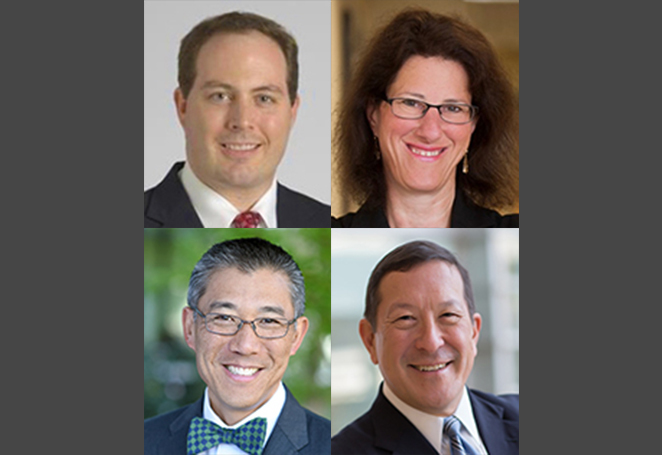 The American Board of Surgery (ABS), the national certifying body for general surgeons and related specialists, is pleased to introduce eight new directors who will join its board this July from the following organizations. They will each serve a six-year term. All ABS directors are currently certified by the ABS and meeting the requirements of the ABS Maintenance of Certification Program. Dr. Barnhart serves as the professor of surgery and pediatrics and program director for the pediatric surgery fellowship at the University of Utah, as well as the medical director for surgical quality and patient safety at Primary Children’s Hospital in Salt Lake City. A native of Pittsburgh, he completed his medical school training at Johns Hopkins University before completing residency and a pediatric surgery fellowship at the University of Michigan. Among other activities, Dr. Barnhart is a founding and current member of the American College of Surgeons (ACS) Children’s Surgery Verification Program Verification Committee. Dr. Chen is surgeon-in-chief and chairman of the department of surgery at the University of Alabama at Birmingham (UAB) School of Medicine, and serves as senior advisor for the UAB Comprehensive Cancer Center. Born in Staten Island, N.Y., and raised in Marshfield, Wis., he completed medical school at Duke University School of Medicine and residency, followed by a surgical oncology and endocrinology fellowship, at Johns Hopkins University. Dr. Chen serves as president of both the Society of Clinical Surgery and the Society of Asian Academic Surgeons Foundation, and is president-elect of the American Association of Endocrine Surgeons. Dr. Dent is director of the general surgery residency program and professor of surgery at the University of Texas Health Science Center at San Antonio School of Medicine. A native of Winter Park, Fla., he completed medical school at the University of South Florida followed by residency at the University of Tennessee, Memphis. The immediate past president of the Association of Program Directors in Surgery (APDS), he currently serves as the APDS representative to the Organization of Program Director Associations and as secretary of the ACS Board of Governors. Dr. Goldberg is surgeon-in-chief at Temple University Health System and medical director of perioperative services at Temple University Hospital, as well as professor and chair of surgery at the Temple University Lewis Katz School of Medicine. After attending medical school at Mount Sinai School of Medicine in New York City, she went on to complete residency at Temple University in her hometown of Philadelphia. Following residency, Dr. Goldberg completed a fellowship in traumatology and critical care at the University of Maryland. She is the APDS representative to the ACS Board of Governors, and also serves as chair of the board's nominating committee. Dr. Larkin serves as associate professor of surgery, interim senior associate dean of educational affairs, vice chair of education for the department of surgery, and interim breast center director at the University of Massachusetts Medical School in Worcester, Mass. Originally from Cincinnati, she received her medical degree from Columbia University College of Physicians and Surgeons followed by residency at Columbia Presbyterian Medical Center. Dr. Larkin spent two years on active duty in the U.S. Navy during residency, followed by an additional two as surgeon on the U.S.S. George Washington. Dr. Larkin is the current president of the Massachusetts Chapter of the ACS. Dr. Mammen is associate professor of surgery and molecular and integrative physiology, vice chair of surgery, associate program director for the general surgery residency, and division chief for oncologic surgery at the University of Kansas Medical Center in Kansas City, Kan. Born in Thiruvalla (Kerala), India, Dr. Mammen grew up in Kaplan, La., and completed his medical school education at Boston University. This was followed by residency at the University of Cincinnati and a surgical oncology fellowship at the University of Texas M.D. Anderson Cancer Center. Dr. Mammen currently serves as Kansas state chair for the ACS Commission on Cancer. Dr. Minter is the A.R. Curreri Professor of Surgery as well as chair of the department of surgery at the University of Wisconsin School of Medicine and Public Health in Madison, Wis. Hailing from Rapid City, S.D., she completed medical school at the University of Texas Southwestern Medical School followed by residency at the University of Florida. Dr. Minter is the current president of the Americas Hepato-Pancreato-Biliary Association and co-chair of the ABS EPAs for General Surgery Residency Task Force, as well as executive council member-at-large of the International Hepato-Pancreato-Biliary Association. Dr. Stewart is chief of surgery at Durham VA Medical Center and associate professor of surgery at Duke University School of Medicine in Durham, N.C. Originally from Shreveport, La., he obtained his medical degree at Howard University College of Medicine before completing residency at Temple University Hospital and Vanderbilt University Hospital, along with fellowships in tumor immunotherapy and surgical oncology at the National Cancer Institute. Dr. Stewart serves as vice chair of the ACS Advisory Council for General Surgery and treasurer of the Society of Black Academic Surgeons. Stacy A. Brethauer, M.D., staff physician in the section of laparoscopic and bariatric surgery at the Cleveland Clinic Lerner College of Medicine, and director of bariatric surgery and associate program director of the advanced laparoscopic and bariatric surgery fellowship program at Fairview Hospital, will join the Gastrointestinal Surgery Advisory Council representing the American Society for Metabolic and Bariatric Surgery. Kimberly A. Davis, M.D., M.B.A., professor of surgery, chief of the section of general surgery, trauma, and surgical critical care, and vice chairman of clinical affairs in the department of surgery at Yale University School of Medicine, as well as trauma medical director at Yale-New Haven Hospital, will join the Trauma, Burns, and Critical Care Board representing the American Association for the Surgery of Trauma. Lawrence T. Kim, M.D., professor of surgery in the division of surgical oncology and endocrine surgery of the department of surgery at the University of North Carolina School of Medicine, will join the Surgical Oncology Board representing the American Association of Endocrine Surgeons. Kasper S. Wang, M.D., associate professor of surgery at the Keck School of Medicine of the University of Southern California, as well as associate chief of the division of pediatric surgery and associate director of the pediatric surgery fellowship program at Children's Hospital Los Angeles, will join the Pediatric Surgery Board representing the American Academy of Pediatrics Section on Surgery. Update as of April 2018: Pramod S. Puligandla, M.D., associate professor of surgery and pediatrics at McGill University, as well as director of the pediatric surgery fellowship program at Montreal Children's Hospital, will also join the Pediatric Surgery Board as a new at-large member. The ABS gratefully acknowledges the dedication and commitment of the following outgoing directors, who will leave the board as of July: Fizan Abdullah, M.D. ; Kenneth S. Azarow, M.D. ; Karen J. Brasel, M.D. ; Martin A. Croce, M.D. ; Mary E. Klingensmith, M.D. ; Christopher R. McHenry, M.D. ; Margo C. Shoup, M.D. ; and James F. Whiting, M.D. We also gratefully acknowledge the dedication and commitment of our outgoing component board and advisory council members, who will also be leaving as of July: Eileen M. Bulger, M.D. ; Mary L. Brandt, M.D. ; Gerard M. Doherty, M.D. ; and Ninh T. Nguyen, M.D.